Stefan Moore is leaving the Phillips 66 Community Stadium as he looks for a full-time role in football. Stefan Moore’s third spell at Leamington is at an end. The former Aston Villa striker had been combining a playing and coaching role at Brakes and was also involved in the Leamington FC in the Community Scheme. 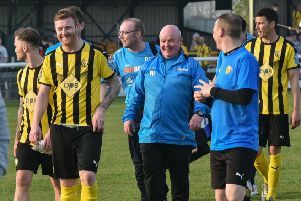 However, Moore is looking for a full-time role within football, with Leamington boss Paul Holleran expecting the 34-year-old to land an Academy role. Despite being sorry to see him go, he leaves the Phillips 66 Community Stadium with a glowing reference from his former manager. “I enjoyed working with Stef, he’s a good character, a real football person,” said Holleran. Moore made 92 appearances for Brakes in his three spells at the club, scoring 38 times. However, it was for his contribution to the Southern Premier Division promotion campaign of 2012/13 that he will be best remembered. “He did a few stints but it was the first stint when we won the league when his was still in his prime,” added Holleran. Meanwhile, Brakes have tied down two more members of last season’s squad with central midfielders Jack Edwards and Callum Gittings having committed for the 2018/19 campaign.